1. Classic multi-function chrono watch.Three sub-dials - second,minute,24 hour and date work,luminous effect,precise quartz movt,durable original battery,simple and clear dial,non fading eco-friendly materials,it\'s a affordable watch. 2. Smooth stainless steel mesh bracelet without any hurts,easy to adjust and quick fits your wrist well,popular colors can match various outfits and occasions,suitable size and weight for both young and old man to wear. 3. This watch used the fluorescent powder which need absorb enough high light before they can glow in the dark. 4. 30m water resistant for daily use.DONOT wear this watch when swimming,diving and bathing. 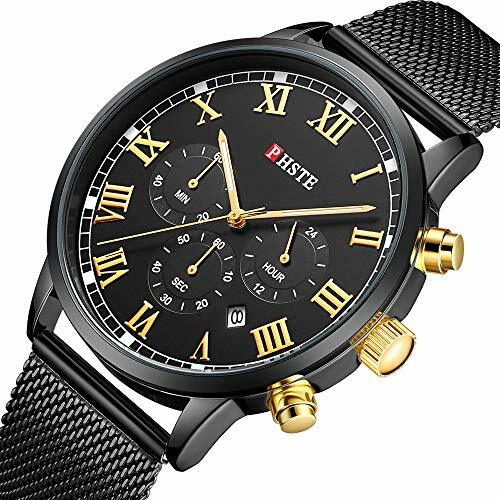 5.cheap online sales of new product in 2019,100% original design good quality wrist watch for men. - Watch Case: IP plated black / gold zinc alloy case,non fade away. - Watch Face: High hardness mineral glass window.scratch resistant. - Watch Band: Solid stainless steel mesh band,safe and comfortable. - You can serch\"PHSTE WATCH\" to view more different brands and styles guys watches. How to adjust the position of sub-dials hands when doesn\'t back to \"60\" position. 1. Pull out the watch crown(middle button) to the second section. 2. Press the button of 5 o\'clock position to adjust SEC sub-dial hands. 3. Change MIN sub-dial hands by adjust SEC sub-dial hands. 4. 24 hours sub-dial moves according to long hands.can\'t be adjusted. 5. After setting,push the watch crown(middle button) back to normal position.